Why would one more bicycle brand decide to enter a market seemingly saturated with every type of bike you could ever hope to find? When Why Cycles launched late last summer, there was a clear reason why the Utah-based company decided one more brand was needed. Of their three models, just one is aimed at the road market, and in Why’s book, the road market has some very fuzzy lines. The R+, or Road Plus, is the antithesis of where most road bikes were just a few years ago and where some currently still are. When you think of an aero road bike, it’s specific to a purpose, and that’s just not the case with the R+. That could be a good thing or a bad thing, depending on what you prioritize in a bike. If a bike that offers wide-range versatility is something of interest, then read on, because the Road+ has a whole lot of it. Where the “+” comes into the name is that the 3/2.5 titanium frame is designed around plus-size tires, which simply means that besides standard 25mm tires, you can run fat rubber up to 44mm in width. Still want to go bigger? Then you can also mount a 2.1 mountain bike tire on 650b wheels. Achieving that kind of tire clearance means that some very shapely tubes are used on the seat tube, chainstays and seatstays in order to achieve the 42cm chainstay length that’s respectably short for a frame with so much tire clearance. As impressive as the tube shaping is in the rear end, there’s more. The downtube goes from round to a flatter profile where it meets the bottom bracket shell in order to better reduce torsional flex. In order to keep those titanium tubes tidy-looking, the R+ has internal cable routing throughout, which also allows the bead-blasted artistic detailing on the frame in various places to remain uncluttered in appearance. Adding to the frame’s versatility and utilitarianism, a third bottle-cage mount is added on the underside of the downtube. Rear rack and fender mounts are also added, although making the seatstay rack braze-ons a little less noticeable would have been preferred. And, of course, disc brakes are standard on the R+, as is a 12x142mm rear thru-axle. Our test bike had an Enve CX fork, which also featured a 12mm thru-axle. Why Cycles sells the R+ in a number of options that range from frame only for $2050, with an Enve fork for $2549 or with a Lauf suspension fork for $2749. It’s also offered in two build options—the SRAM Rival kit for $4199 and the SRAM Force kit for $5899, which is what we tested. From front to back, the craftsmanship on the Why is impressive. The Force kit is nearly a dream-bike build in our book, which says a lot for a bike that’s sub-$6000. First off, the SRAM Force 1x group is a favorite of ours, since it adds so much simplicity to a bike. An Easton cockpit isn’t something we have seen much of lately, but since the EC70 carbon bars had a comfortable bend and the EC70 SL seatpost didn’t slip, we had zero complaints. There’s also the ability to run a mountain bike-style dropper seatpost with an internally routed cable if that suits your fancy, but we weren’t quite ready to go that route just yet. The most notable parts of the build that, in our opinion, give it added-value status are the Knight carbon rims with Project 321 hubs. That’s a very high-end wheelset for the price, and once the tubeless, 40mm-wide Maxxis Rambler tires are added in, it goes up another notch. There’s no doubt that Why Cycles is delivering a lot of bike for the money, but it’s also of note that they have a consumer-direct business model, so taking one for a test ride from your local shop isn’t an option. A more surprising addition for those who buy a complete bike is that you’ll receive it in an EVOC Pro travel bag. The bag alone would retail for over $500 and allows Why Cycles to ship the bike with nothing more needed for assembly than putting on the wheels and the handlebar. If you ever have to ship or fly with the bike, then the case is truly an added value. The trend for greater road bike versatility isn’t something we see as just marketing jargon, considering we’ve been preaching the very same thing for the past five years, so we applaud the arrival of Why Cycles and their R+. Out on the road, or dirt road to be more specific, there’s nothing to be left wanting, considering the large-volume tires and titanium frame adequately snuff out the vibrations. A long front-center and fork rake make it anything but twitchy up front and easy to ride hands-free while digging around for the bar in your jersey pocket. The slack head angle made for some slower-than-race-ready steering. Granted, the very things that make it a Dirty Kanza dream bike are the very things that go against it for those who might want a bike that can also double as their group-ride roadie. In comparison to a straight-up road bike, turning is labor-intensive due to the frame’s long (105cm wheelbase). A rider wanting a more relaxed ride on the road than what an endurance road bike delivers wouldn’t be disappointed in what the R+ brings. 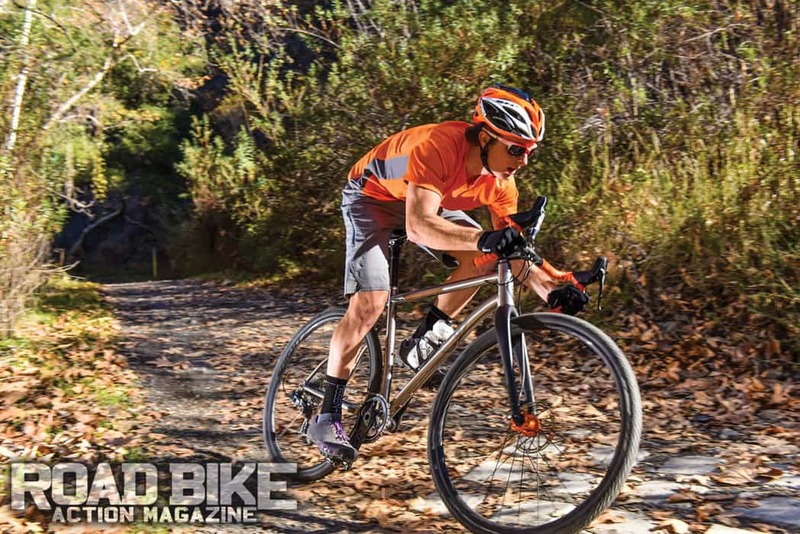 As a gravel bike that can take on nearly anything, the R+ is a bike that should be highly considered by those looking at the ever-popular Open U.P. that has become the go-to gravel design. Of special note is the titanium construction of the R+ that is going to be far more impact-resistant than a carbon frame, which has to be a consideration for off-road use. For riders less concerned with tire clearance for more than a 35mm tire and plan to spend a large portion of their riding time on the pavement, there are other options out there that will deliver quicker handling than the R+, if indeed that’s what you want.